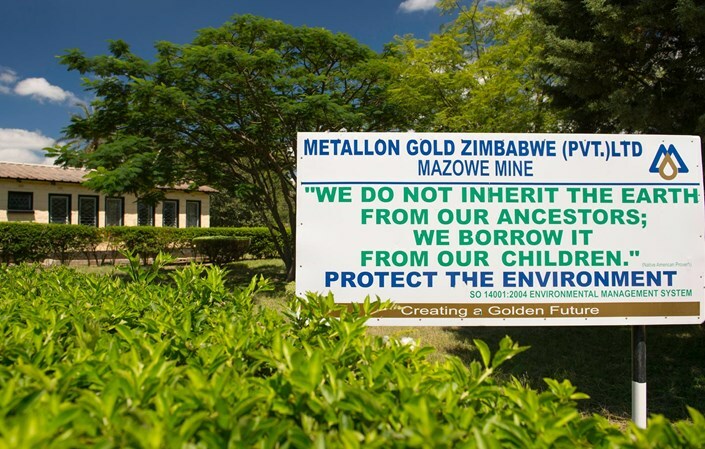 THE country's biggest gold producer, Metallon Corporation says it wants four of its mining operations in Zimbabwe to reach their full production capacities this year. Metallon owns How Mine, Mazowe, Redwing and Shamva mines. The company started restructuring last September with each of its mines now operating under separately registered companies. The companies are Bulawayo Mining Company, Goldfields of Mazowe, King's Daughter Mining Company and Goldfields of Shamva. In an interview with an online publication, the company's chief executive officer, Mr Ken Mekani, says their initial and short-term strategy is to reduce operating costs while ensuring each of the four mines reach their full designed output capacities. "Our focus for 2018, which will be to bring the mines to capacity, is a critical first step that needs to be taken before we can initiate our expansion projects," said Mr Makani. The group expects to produce between 120 000 and 130 000 ounces per annum. Mr Mekani said Metallon's long-term strategy is to increase production to 500 000oz of gold per year by 2021. The company has already identified growth projects at each of its mines and is undertaking necessary feasibility studies for the identified expansion projects. "All of our mines remain open at depth and are under-explored across their strike extensions," said Mr Mekani. The mining concern's restructuring exercise is part of a strategy to increase efficiencies in order to meet growth targets. "By making the mines stand alone operations, we are able to increase efficiency and allow each mine to manage its own assets and operations more effectively," said Mr Mekani. How Mine is Metallon's biggest gold producer responsible for 55 percent of the company's total gold production. "We have begun a shaft deepening project at our 16N7 shaft and will be extending the shaft depth from 28 Level to 34 Level as a means to open up new mining areas to increase production volumes at the mine," said Mr Mekani. The company has also identified, through infill drilling, an old working area called 320 North; which is an extension to the ore body currently being mined. "We have begun re-developing this area and it is delivering good grades," said Mr Mekani. At Shamva Mine, the company's second largest gold producer, accounting for 25 percent of total gold production, work is underway to unlock the significant surface potential at the Shamva Hill prospect. At Mazowe Mine, which presently accounts for 15 percent of total gold production, the company is undertaking a robust surface exploration programme at the Amatola prospect. The Redwing Mine is Metallon's smallest operation, accounting for about 12 percent of total gold production. The mine was placed on care and maintenance in 2008 and resumed operations in 2015 after being de-watered.